Matt is getting more & more in the habit of printing out recipe he finds online for us to try. It seems like almost everyday I walk into the kitchen & find a new one sitting on the counter. He found this wonderful curry recipe from Tyler Florence on Serious Eats' Dinner Tonight Section. As far as curries go this one incredibly easy to make & really cooks up quickly (especially if like me you decide not to make ghee like the original recipe called for). We really liked the texture of the cauliflower against the soft chickpeas in the final dish. The flavors really mellow with cooking making this a really comforting dish. The cilantro added at the end added a bright flavor. I added some greens to the dish for color & the added healthiness. Meal the butter over medium heat in a soup pot. Add the onion, curry powder & ginger. Cook until the onion is soft. Add the tomato & cook for 6 minutes. Add the broth & tomato paste & stir. Add the chickpeas & cauliflower. Cover the pot & let simmer for 15 - 20 minutes, you want the cauliflower to be crisp tender. Uncover & allow to cook until the sauce is the desired thickness. Add salt as needed. Serve over rice if desired. Sprinkle each serving with cilantro. Kat, I wish my husband would eat more vegetarian dinners, I would happily make this, I have a head of cauliflower from the farmers' market in the fridge, wondering what to do with it! I never really watched Tyler Florence on the food network but the few times I've tried his recipes they've been delicious. this looks like something we would enjoy. adding to my wannamake list! I love all of the different kinds of food you make! Such a wide variety, and it always sounds wonderful! My mom made this on Sunday with turnips, cabbage and potatoes for a side instead of rice. It all turned out really well. She also added grilled lamb chops and picked up some naan from our favorite Indian restaurant. I spent so many years dodging my aunt's alu gobi that I can't admit that I think this version looks really tasty! I need more cauliflower recipes. Cauliflower is readily available and everytime I've been passing up on it because I don't know what to do with it. I'll put this on my must-try list. 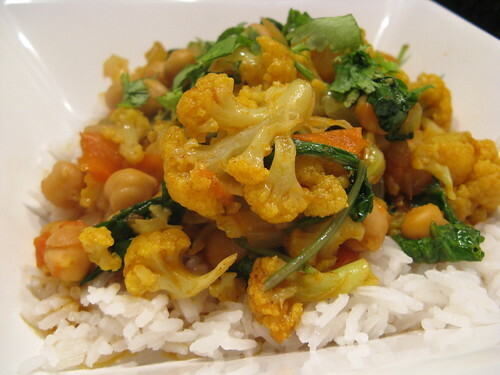 I recently made curried cauliflower too. I wish I had seen this earlier, yours looks great! I *love* this recipe and I have made it at least 3 times since finding it! I love that you added some greens and I think that is what drew me to try your recipe. Last time I added some cubed sweet potatoes with the cauliflower and it was awesome. My husband detests cauliflower and has for 21 years. I made this recipe last week in a large quantity and he could not stop eating it. He is telling everyone about it and asked me to make it again tonight.